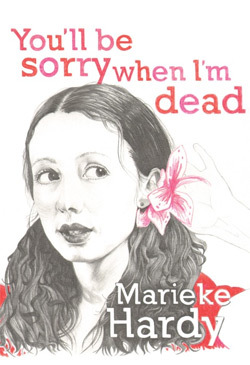 You’ll be Sorry When I’m Dead is an intriguing title for an autobiography. With a title like that, I expected the ex-Triple J breakfast show host, First Tuesday Book Club co-host, The Age opinion columnist and all-round Left Wing political nuisance Marieke Hardy’s memoir to be a punch in the guts and hard, meaningful double rude-finger to her critics. Conversely, it was a quirky, sentimental, candid and hilarious depiction of some of Hardy’s past activities and exploits. However, while she makes it clear she has some nemeses out there (basically anyone from the Liberal party or of similar conservative persuasion), she doesn’t use her book as a forum for spreading her opinions or chastising those who have done her wrong. Instead, the book is deeply personal, and is perhaps a reflection of thoughts she has towards her own mortality, as she seems to live each moment with a fierce energy and passion. Everything she does, whether it be drug-fuelled month-long benders, or wallowing in depression following the breakdown of a relationship, Hardy’s actions have an admirable power to them. Whatever she does, she does it with all she has, and that makes for excellent reading. Seeing as there is legitimately a chapter on writing letters to companies about their products AND on the joys of scrapbooking, her happy-go-lucky perspective keeps the reader engaged, making even mundane topics enjoyable. What is particularly gripping about the book is Hardy’s brutal honesty about her exploits and relationships. This is displayed by admitting to past mistakes with lost friendships, heartbreaking journeys through grief and lovesickness and funnier encounters with strippers, prostitutes and swingers. Even the toughest, most awkward anecdotes have a warm edge to them, particularly regarding her close friend’s battle with cancer. (CAUTION: For this reason, I do not recommend reading this book in public, as you may, like me, find yourself weeping uncontrollably and then genuinely ROFL’ing on the same page, so people may think you not entirely well). This honest policy towards relationship with family, friends and lovers doesn’t always leave her in the best light. This is admirable as it shows Hardy wrote this book to share herself and her journey with the public, and not as a vessel for further propelling her career and political voice. Indeed, the deeply personal nature of this book glosses over her public career almost entirely, giving very little detail as to how Hardy got to where she is now. For someone about to enter the media industry, this is frustrating, as Hardy has dabbled in almost every facet of the media. In lieu of industry-entering pointers and career flaunting, Hardy invites responses from key characters that feature in chapters as an epilogue, so that they can share their version of the story – with the response from one ex-boyfriend making the reader feel slightly voyeuristic (which is kinda exciting…). This entry was posted in Arts, Books and tagged book review, lip lit. Bookmark the permalink.